Poppet’s Window doesn’t usually give shout outs willy-nilly, but if you can change lives by drinking coffee, then surely that’s worth a yarn. 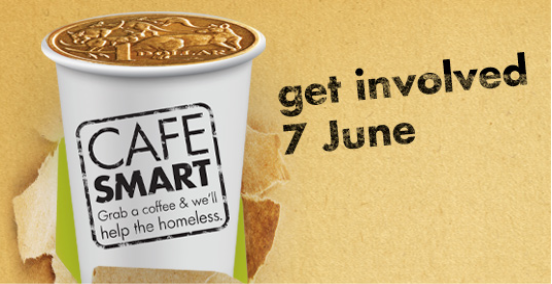 In a week from today on Friday 7th June, StreetSmart’s third annual CaféSmart campaign is taking place, where everyone who has anything to do with caffeine can get involved and help the homeless. Simple. You visit a participating café, buy your skinny latte with four sugars or whatever it is you drink, and then $1 from your coffee funds local projects that fight homelessness. A list of participating cafés is available here: www.streetsmartaustralia.org, but some of my favourites include: Bluebird Espresso, De Clieu, Common Galaxia, Everyday Coffee, Friends of Mine, Hobba, Pillar of Salt, St. ALi and Three Bags Full. Give a little bit extra. Match the cafés donation with a dollar of your own. It goes a long way, and it’s only a coin at the end of the day. Cafés across Australia raised over $74,000, up from $47,000 the year before. For any cafes still wanting to participate, call CEO Adam Robinson on (03) 9836 1887. Don’t let homelessness fall into the “too hard basket”. Get your friends and colleagues involved.